Warsaw’s clubs may take their lead from Berlin, but as the city’s scene comes of age, it’s forging a new vibe of its own. Local DJ and promoter Simon Mattson reveals why. Ibiza Voice: tell us about your party? Simon Mattson: I have been working as a promoter for almost ten years. During this time, I focused mainly on booking artists for clubs or festivals, not on creating my own brand. I was working as a manager of Piekarnia Club, when it was one of the first clubs in Poland responsible for booking international artists. This place has become legendary, so it is a great honour to be a part of it. I have been managing many clubs, including one of the first summer spots called Temat Rzeka, located at the riverside in the centre of Warsaw. It was an amazing place but was sadly closed by the city, due to loudness restrictions. Currently I am involved in organising a series of summer events called Roof Party. What’s the scene like right now and how does your party fit in? I was born and raised in Warsaw. This is my city. Our music scene had its ups and downs, but I am happy that we know what a proper underground party means. Both Warsaw and the rest of Poland are focused on a German style now. ‘Techno’ is unfortunately perceived as a ‘lifestyle’ rather than a pure music genre. This is unfortunate, because for many people both tech house music and anything not commercial are understood to be techno. But we have many good underground events with a great vibe. What’s the best thing about the scene in Warsaw currently? A huge advantage is that there are more and more clubs and promoters for whom sound quality is very important. The brand sound systems such as Funktion-One, Void, L’ACOUSTICS or Martin Audio appear in many places. The satisfaction of playing on such equipment is totally different, not to mention the quality of music heard on the dancefloor. From my point of view, the best club in Warsaw is Smolna. The club aspires to be one of the most important venues in Europe. It is a pleasure to play there and play regularly as a resident DJ. There are regularly many important names from the international music industry. For a year of activity, we have already been visited by such artists as Dubfire, Patrice Baümel, Guy Gerber, Amelie Lens, Jeff Mills, Josh Wink, Tale Of Us, Loco Dice, Joris Voorn, Âme and many more. A very important element of our scene is the Audioriver festival. Foreign media have mentioned it many times as one of the best electronic festivals in Europe. I can definitely say that it is a trendsetter in Poland. 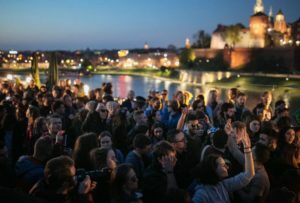 The festival takes place about 70km away from Warsaw, in Plock, but people from all over the country and abroad come to this event. Another festival [worth mentioning] is Instytut. One of the legends back in the days which is reborn now with proper events at amazing location in our city. It is a huge thing for all techno fans. I have to mention Luzztro Club as well. It has been playing a big role in Warsaw for over 14 years. This is the most famous after-party club in Poland and the parties rarely finish before noon the next day. We also have great outdoor events, such as Lost Pool – a summer techno party at amazing industrial locations in the centre of Warsaw. Big Boat Party is one of the most eagerly awaited events during summer. It’s pure madness on the Baltic Sea. What do you think sets you apart from club scenes in other cities? We’re definitely closer to what is happening in Berlin than in London. Our entire market draws inspiration from what is happening in Germany, mainly in Berlin but the Smolna Club is up there with all of them. There is probably no better place in Poland, where so many great things happen. It is totally inspired by Berlin. There is a ban on photography, so people focus more on music and entertainment instead of looking at their phones. There are several clubs in Poland definitely worth visiting, such as Prozak 2.0 in Krakow, SQ and Tama in Poznan, Das Lokal and Pralnia in Wroclaw or Sfinks700 in Sopot. Our scene is definitely quite young compared to the United Kingdom or Germany. We have still a lot to do here and there are many events organised in Poland by Germans, like Garbicz Festival or Plötzlich am Meer. What challenges do you face how do you think these can be overcome? The huge challenge for clubs here is to book well-known artists from the international scene and our economic situation is worse than in the United Kingdom or Germany. Our average national earnings are much lower than in those countries while the foreign DJ fees are usually the same. Booking events with just Polish artists, instead of famous international artists would be a big challenge. People are used to events with foreign guests, but I think people should start coming to events for the music quality and vibe and not only for the artist names on the flyer. We have many good Polish DJs, so to achieve this goal, we should invest more in the venue atmosphere, animation and setting. How do promoters in Warsaw get on with city officials? There is no proper support [from the officials.] I am looking forward to a generation-changing in our government. Of course, we have a few institutions that support music and culture but they are more focused on bigger events that combine different styles of music, not only house and techno. What’s happening musically in the city currently? What sounds are popular? what’s always been popular? Or what’s breaking through? Techno is the main style of the underground scene at the moment. It is definitely a great moment for all techno DJs and producers. But as a tech-house artist I can’t complain. From what I see looking at people on a dance floor, the music style is not that important. Things like an idea, groove, energy or an element of darkness really count. However, I have the impression that Poland may soon tire of heavy beats. It seems to me, that the music trend that has developed at Burning Man, will soon also come to Poland. That slower form of electronic music with ethnic elements. It is something that is slowly beginning to show up here and I believe that it will have a big impact on our music scene. Is it a good place to be an artist? The costs of living here in Poland are lower than in Germany or England. However, it is not a perfect place to develop an international career. Many famous artists from all over the world as well as booking agencies and management companies are in Berlin and in London and contacts, as we all know, are very important. I have visited artist studio hubs in England and Germany, where you can rent a room and become a neighbour to many talented artists. You can get more contacts, exchange equipment and experience and we are missing those that kind kind of artistic society in one place. What does the city need more of? More diversity and more events outside the clubs. And what does it need less of? Less rainy days and less politics on the music scene.